Start a new tradition of a lifetime of vacation memories. This magnificent, new, 2500 square foot, three story home, is on the corner of Scenic Gulf Drive and just steps from the beach access that leads to the world’s most beautiful beaches! This family friendly home features a third floor with 2 Master Suites, each with a private bathroom. Keep your smaller children close by in the separate bunk area. Escape to serenity in your third floor private sitting room equipped with a mini-wine cellar, or enjoy the breeze and sounds of the ocean on your gulf-view balcony. The main level on the second floor offers that great central meeting area, conducive for planning out tomorrow's adventures. Enjoy a home-cooked seafood feast or an afternoon snack in the fully equipped kitchen, with stainless steel appliances, granite countertops with eat-at bar. Watch a family movie on the 42' HD with surround sound TV or tune the entire house, pool and courtyard to enjoy your own music, direct from your iPod or MP3 player. This level also includes a private queen-size bedroom, perfect for the in-laws, and a bathroom with stand-up shower as well as full-size sleeper sofa. Enjoy your day of shopping, adventuring, site-seeing or beach-going on the '24 mile long ribbon of sparkling, snow-white beaches' of Destin, as voted the #1 'Beach Town/Resort' in the 2008 Southern Living 'Readers' Choice Awards,' January 2008 edition. Then relax in the lush landscaping of the private courtyard, reminisce over the day's events, take a dip, or just sit and listen to the home’s namesake “Neptune”, a wall-mounted fountain, as he emits his spray into the private heated lagoon pool. The pool is enclosed, separate from the courtyard, and the first floor doors alarm when opened. Scenic gulf drive walking path just in front of house. Three common areas on each elevation. 50 videos to choose from. We have stayed at Neptune's Nook several times and it has been perfect each time. This property is as close and convenient to the beach that you can get without paying beach front prices. The owner is incredibly responsive and can imagine he would be helpful if any issues arose, but we have not had any. However, he has kept in contact each time, checking in to see if everything is ok, so I am sure he would be on-the-spot to address any possible issues. The house comfortably sleeps our two families (4 adults, 4 children ages 3-6) with much room to spare. We had an empty bedroom on the ground floor that we did not need to use. There are plenty of games, movies, and books at the house to entertain the kids. There are also tons of beach toys to use during your stay. After learning this on our first visit, we were able to greatly reduce our carload on subsequent vacations. The private outdoor pool and patio are perfect if you have to take breaks from the beach. In our case, it has been nice to not have to be completely away from the sun and water when a kid has to come in to take nap. As perfect as it is for families, I can see it working just as well and comfortably for groups without children. 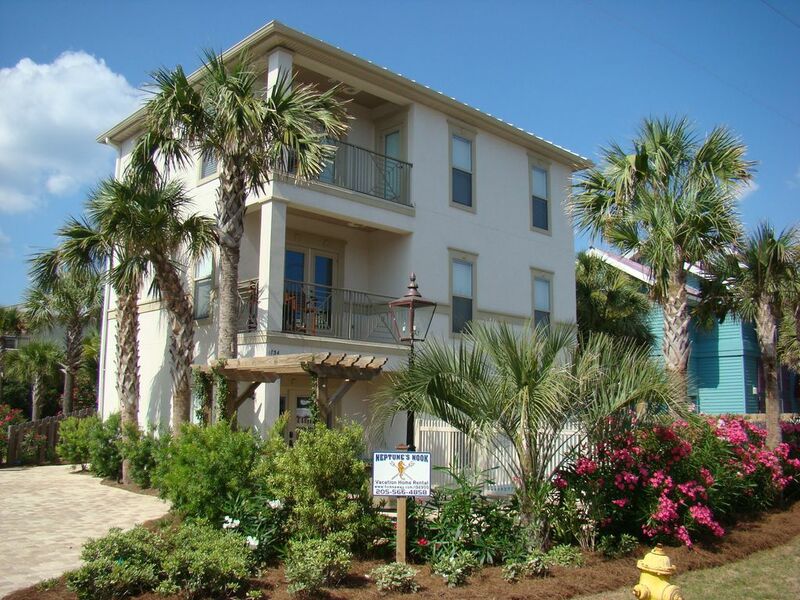 I have been coming to the Destin area for over 25 years now and stayed in all types of properties all along the beach - and this one is my clear favorite because of the setup, amenities, price, and location. Cannot recommend enough! Thank you so much for the great review. Glad you and your family have such a good time at our home. Neptunes Nook was a great place to stay! Close to the beach, with a great splash pool for the kids. The house was spacious and very quiet to outside noise. Mr. Brown was so great to work with during the rental process. He was very quick with replies to my questions and made me feel at ease with the rental details. The house was perfect for us ! Thank you so much for the great review. Im so glad you and your family had a great time at our home. Please keep us in mind for your next trip to the coast. Great rental to stay in with children. Direct access to the beach from the house. Small pool to cool in after a hot day on the beach. Place to rinse off sandy toes and toys right by the pool. Spacious family space with amazing bunk beds. Great for multiple families. Lots of sand toys so no need to bring any. Small gated in back year to hang wet clothes to day. Dairy Queen in walking distance. Outlets five minutes away. Great sidewalks for walking or running. Overall an amazing stay. We will definitely consider it for future family trips. What a wonderful vacation. Dale was outstanding to work with on our reservations, made everything so easy. The home and location was PERFECT! Right across the street from the private entry beach, just steps away. We had 3 families with 3 teenage boys and the home was plenty big. The amenities we fantastic, beach service was a bonus that we thoroughly enjoyed. Great location, walking distance to Pompano Joe's and Whale's Tail. The home was equipped with everything one could need and was spotless when we arrived. Thank you for sharing your home with us. We will most definitely return! Thank you so much for the great review. So glad that you and your family had a wonderful trip to the beach. Please keep us in mind for your next vacation. Thank You. Love this property. Pool was perfect for the kids and location is beyond fantastic! Had three families one on each floor and each had their own private retreat. Would recommend to anyone who wants beach proximity, right next to restaurants, beach bike rides, pool, and did I say beach proximity. The House and it's location was amazing. Perfect for a large group as we had 11 with 3 small children so pool was perfect as well as close location to beach (no long truding walks to beach loaded down) The house is in very good shape with everything you need. We have been to destin 4 times and stayed in a home each time but we will not be looking any further. This one is it for us!!!!! Thank you Dale and Adelia for sharing it with us we really appreciate it.